To avoid confusion, further we will strictly use its alternative name glass-box testing. Glass is transparent but impermeable - exactly like a real glass-box test! 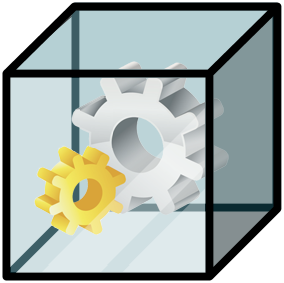 What is glass-box testing actually? Even by glass-box testing we still access the component only via its API, but we do have some internal knowledge about what's going on inside (as glass is transparent), which makes use of it for better "informed" tests. For example to find interesting test cases and input combinations (as we usually can't test all possible variants of input exhaustively). Without this internal knowledge we can't do code coverage - how can we know how many lines of code are test-covered, when we actually don't know the code?! As the method save doesn't return anything (void), it is very difficult to test it only using its API contract (interface) - all we can do is to call the method with a combination of input parameters and check if no error occurs. And, theoretically, we can use this interface to test if the record can be loaded after being saved. We Don't Need No Mocks! Uff, that was a lot of stuff we had to do to test such a simple rule. We had to mock three repository objects! This is pretty cool, but can we go even further? Our domain rule is now fully implemented in the Delivery domain object while DeliveryService was reduced just to integration with the external resource (repository). The domain rule is now test covered with a simple unit test without need to use (or mock) the delivery service. Services must be tested as a part of integration testing against real resources (e.g. databases) to check if they are correctly integrated, but domain rules stays in the deepest part of the domain model and could be fully covered with simple unit tests without any need of mocking.